Sandpit covers are a cost effective way to protect your sandpit from adverse weather and also from cats, dogs and other animals. A cover provides an effective deterrent and it also helps to reduce the frequency that the sand needs to be replaced. They help to keep your sandpit a safe and clean area for children to play in. Our sandpit covers are made from high quality PVC which is completely waterproof and have reinforced hems. They can be easily secured using the elastic bungee cord which is threaded through the eyelets around the cover. 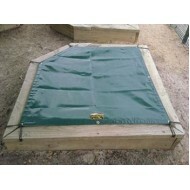 These sandpit covers can be made to any size or specification so they fit your sandpit perfectly. Sandpit covers are popular with schools, playgroups, nurseries and private use.